This trip has been an amazing experience for me. I have seen so much. My feelings are much like the terrain here, up and down. From the low of seeing such poverty to the high of meeting such wonderful, happy, and gracious people. This land and it’s people are so beautiful that I have trouble putting my experience into words. I only wish we could have done more than we did. I wish we could have spent more time with the people we met. I am so grateful to these people for allowing me to see this land and it’s people. I thank God for the opportunity to have this experience with my fellow teammates. This was my first time traveling on an International Hábitat build and the entire experience was everything I could have hoped for…and more. We were provided a great opportunity to advance the construction process of a new single family home and it was very fulfilling to see the progress we were able to make in just one week. The family seemed very grateful and it was also wonderful to be able to connect with them on a personal level. Like so many parts of the world, Honduras has a tremendous need for more help and support, but ultimately it will only happen “one starfish at a time. Thanks to Celeste, Jose, everyone on our team and everyone from Habitat for helping and supporting us…and I look forward to returning again! I volunteered to go to Honduras with Habitat for two reasons: first, Celeste Cox asked me to go . Second, as a parent (and originally a kid:) home has always been important to me. It literally breaks my heart when I think about families who don’t have a home – or live in truly dire circumstances. So I went to Honduras “to give back”. To help build a home. What I didn’t anticipate was the genuine joy and loving nature of the men, women and children we were there “to help”. These amazing people are “wanting” in so many material ways (running water, sewer, electricity) and yet they have an amazing strength of spirit and heart! We were welcomed into homes, we were prayed for and we were thanked. I was there to help and ended up receiving the greater blessing. Looking back, the biggest thing I see is the vast need for adequate housing. We were able to contribute a week on a home to help a family. The good thing is that Habitat Honduras is reaching throughout the country addressing the vast needs. It is a huge task. On the previous build, we were able to start the foundation of one house, and Habitat finished the rest of the development. The key in that is they were contracting Hondurans, which assists with another issue, jobs……win, win. Habitat Honduras is self sustaining through the fund for Humanity (mortgage payments), which should be a model to the rest of Central America. The beauty of the country stands out over everything. I enjoyed working and getting to know our crew. We worked as a team, getting the job done. A great bunch of people. This year was very special to me because our build fell during the Lenten season. I love to take time to reflect on why we do what we do everyday. Taking this time away from office work, school, kids and general busyness to see those that are in such need filled my heart knowing that we continue to serve those with the greatest need through our labor of love and our sweat. We had an amazing team that worked really hard and shared many special moments. It seemed as though we were coming home to see familiar faces: Jose from Habitat Honduras, the homeowners in Copan at Habitat Maya from our last build and a special reconnection with Melida, Natali and Daniella who we met last year. We also got to know our new team members more intimately and connected with a medical team, and of course Fany and Faubion, our new homeowners. The joy on their faces and warmth in their heart made the whole week worth it. I wish I could stay here forever to continue to do God’s work, but I know that his work is everywhere we go. Until next time, Love to Honduras. “Somos albaniles” – We are masons! Building walls and eliminating barriers. 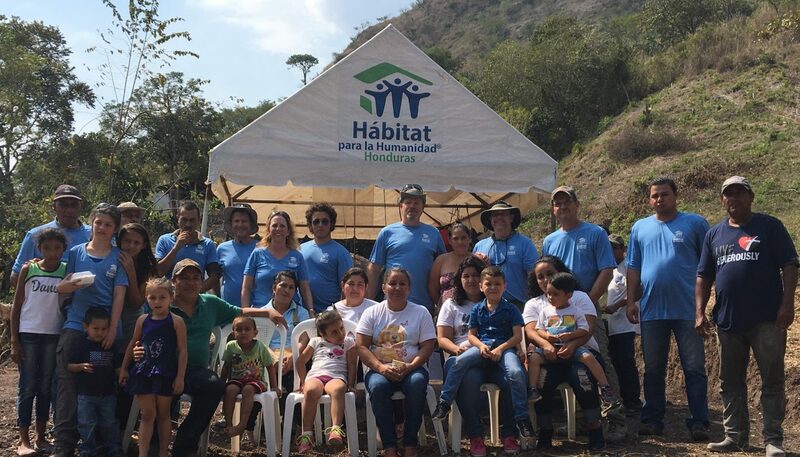 I asked the chance to write the blog today for two reasons; one as part of the staff of Habitat Honduras, to formally thank the Affiliate of Collin County, Texas for the support they have given our program through the years. The second reason had a vested interest. Two years ago I hosted Celeste and her group for a week in Copan Ruinas, it was my first time as host and they set the bar very high. Welcoming them again this year felt more like a friend’s gathering. Today was the last build day, and the team continued to perform admirably, even after the whistle signaling the end of the work for the day. Not that the team was prone to munity, on the contrary, the whistled just blew before they were done and they simply wouldn’t leave the task unfinished. We also had the opportunity to meet Fabian Pardo, the homeowner, born in Cuba but nationalized as a Honduran due to his love for Fany. He arrived at the site early in the morning to meet us and even lent a hand here and there. The regional office from Copán, managed by Maricela Llendos, organized a farewell ceremony that moved to the beat of a marimba. The short program started with Fany leading the attendees in prayer, then the moving words from Fabian as homeowner. After the diplomas and souvenirs for the teams were given, the music played until it was time for another surprise, a little piñata that became the thrill of the several kids who attended. All in all it was a great day. When we arrived on Monday, the site only had a couple of walls up and the floors were not done. In only five days, the site look more like a house, with all the walls up, just awaiting the overhead beam to set the roof. Once again, my thanks to Celeste, David, Gerelyn, James, Mike, and Miguel, for their labor of love for our five-star country. After working today, we tried to go to see an eco stove but the road was too steep and rocky to make it. We stopped by a Habitat house and got too see a finished one on the inside. Maricela also gave us a picture of a completed house based on the plan we are using. Today we continued on the walls and floors. We switched up teams and trained Miguel and James on being masons. We all worked really well together as a team. Daniel and Jesus (the masons) we’re pleased with our work!! Great news is no one has gotten sick!!! James the giant could reach the wall without scoffolding, so he was a great block setter. After we left job site, we went to La Campa which is know for its pottery. La Campa has 8,000 population and their major industry is Pottery and coffee. We met the City Secretary – Bacillio Pascuala who told us about his town. The church was built in 1720 – St Matthias. St Matthews in English. On Feb 15-20 they celebrate their saint with a fair and dances and traditional music with drums. 1,000s of people come. The first church built was Hermita church -it was known as a cemetery for kids. We then toured a pottery home and met a sweet lady named Desideria She told us her story. She’s been making pottery since age 12 and has been doing it for 52 years. We continued bringing in dirt for the floors. Miguel kept making triangles for the rebar. Geralyn and Celeste became masons and built two interior walls. James and David were tampers on the dirt. Mike made rebar and moved dirt. Here’s pics of the progress. We also made plenty of trips to Gladys house (our bathroom for the week). On one trip we met a little boy named Juan carrying a machete. He posed for a pic! The Moto taxi parked right on the front porch at Gladys house. Tonight we are going out to dinner. The dirt pile was pretty far from the house so we moved a lot of dirt. Our house leader is Daniel and his assistant is Jesus. Monday was Jesus first day on the job. Tonight we went to Casa Hotel Celaque for dinner. The mountains were in the background. It was beautiful. Each night we share devotionals with each other. Last night we went to mass together. Tonight’s devotional “what would Darryle do” our team coming together to support each other.